If there’s any video game that has successfully made its way into the classroom, it’s Minecraft. There’s a small subset of teachers using all kinds of digital games in interesting ways, but the blockbuster hit Minecraft and its educational counterpart MinecraftEDU have reached much wider audiences. But getting started with MinecraftEDU can be intimidating for teachers who don’t consider themselves “gamers” and aren’t sure how to harness the engagement and excitement of Minecraft. Luckily, there’s a robust and global Minecraft teacher community to supply tips, support and even lesson plans. Teachers who already use Minecraft in the classroom love it because of the flexibility it offers -- almost any subject can be taught with a little creativity. And like other powerful learning games, well-structured Minecraft lessons give students opportunities to fail and try again, improve their skills, and participate in an immersive environment that aids retention because students can attach the academic concepts to their personal experiences within the game. “When you are in a game, all that information in the immersive world is tied to your heart and your emotions and that becomes a very powerful retention tool,” said Garrett Zimmer, president of MineGage, a company that makes Minecraft lessons with extra programming to track progress. Zimmer became famous among Minecraft players for videos of his own play and has since turned his coding abilities and Minecraft prowess towards creating pre-made worlds and lessons for teachers to use. Zimmer and other experienced Minecraft teachers say it’s important to manage expectations when using Minecraft in the classroom. Many students already have experience playing the game for fun, so the teacher needs to explicitly set the goals and expectations for conduct within the game at the outset. Zimmer says most kids will be so excited to be playing the game in school that they won’t mind the extra rules. Teachers are finding ways to use Minecraft in every subject, but in some ways the game is best suited to history because it’s so easy to download worlds other people have already made in Minecraft. Without much effort or time, a teacher can have a three-dimensional, accurate map of medieval London at his fingertips. Students can then see and experience the time and place in a new way, bringing history to life and giving them a personal stake in it. Miller’s students are generally poor at reading and writing, so it was important for him to inject lots of literacy skills into his content teaching about medieval world history. He collaborated with Robert Walton, a former teacher and current young adult fiction writer, to write vignettes introducing each part of his curriculum. Then he’d set his students loose in Minecraft to explore a “map” that he’d downloaded from the MinecraftEDU website and customized for his purposes. Each vignettes tells a loose story about some aspect of Dark Ages history. The quests Miller designed take the narrative further and ultimately lead students through the Minecraft map and into the next story and part of history. For example, Walton wrote a story about the first Viking raid in England, told from the Viking viewpoint. Miller had his students close-read and annotate the story to be sure they understood it. Then he set the kids loose in Minecraft to wander around the village post-raid, interacting with various characters who told them a different side of the story. Miller asked his students to write reflections about what they’d seen and learned about each period of history. “I’ve gotten the best writing I’ve ever gotten in 21 years from kids,” Miller said. Normally he would dread reading 160 essays about the same moment in history, but because each kid wrote from his or her own perspective, each piece of writing was different. “I enjoyed it so much because every kid wrote from a different perspective, from how they saw it,” Miller said. And by the end, kids had written much more than they ever thought they could. “Kids who were struggling to write a paragraph at the beginning of the year had written 40 pages of amazing storytelling,” Miller said. Like many public schools, Chalone Peaks doesn’t have an art or music program. 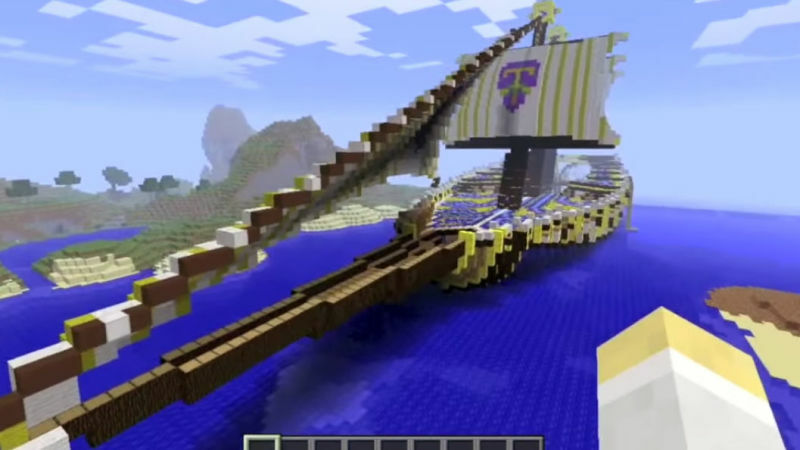 Miller has found that Minecraft has not only helped fuel a passion for history in some of his students, but it also provides a creative outlet for them. When he teaches about medieval Japan, he asks students to write Tanka poems, a precursor to the haiku usually focusing on nature of emotions. Then in Minecraft, students built paths that represented the themes of their poem. As a player moved down the path and stepped on each block a line from the poem would pop up. “When the kids are creating these things, I’m not only seeing on the screen what they are creating, but in a way I can see their thinking,” Miller said. He plays the game with them, interacting with them there, which also allows him the time to build relationships through a medium that they like. Talking with them about what they are making and why is also a great way to assess their learning. The game also allows for differentiation - more advanced students are free to make more detailed and impressive projects. “The creative aspect was critical to see if they really understood what the words of the poem really meant,” Miller said. Even though his students speak English, about half of them come into 7th grade writing and reading at a 3rd grade level. Writing verse is a particularly hard task for them. The middle school textbooks and primary source documents are often inaccessible to them, but Miller has found that Minecraft helps them experience the history and then participate more in constructing new knowledge about it. Miller understands that some teachers may feel intimidated to get started with Minecraft, but he’s never regretted taking the leap. He suggests starting a Minecraft club after school to build interest and give the teacher time to familiarize herself with the game. The MinecraftEDU teacher community is also robust and generous. Most teachers freely allow downloading of worlds and lessons they’ve created and Miller often copies parts of other worlds and then positions them in his own map for a specific lesson. “It’s surprising how much is out there and the vast majority of it is free,” Miller said. And if it doesn’t already exist, many Minecraft enthusiasts are happy to build it. That network of educators has also been an inspiration to Miller who likes having a cohort of colleagues with whom he shares ideas and gets feedback. He does note that schools need computers to run the MinecraftEDU software, not iPads or Chromebooks. But MinecraftEDU is affordable (roughly $18 per seat) and doesn’t require that a school have its own server. Minecraft might not be an obvious teaching tool for a Spanish language teacher, but Glen Irvin has found that his high school students are using language more often and in more complex ways since he started using the game. He was worried teenagers would find Minecraft stupid, but was blown away by its success when he gave it a try. “There’s nothing built for second language teachers, so I had to come up with some scenarios myself,” Irvin said. For example, in a unit about the language of business, Irvin asked students to collect resources like lumber and iron in Minecraft’s “creative mode.” Students then set up businesses, bartered with one another and posted prices in Spanish, all the while speaking to each other and conducting business in Spanish. “It was way better than what we normally what we would have done, which would be a fake skit,” Irvin said. “It blew that thing away.” Students were so into the project they even started looking up extra vocabulary words and grammatical constructions so they could communicate better with one another. Irvin also always stops the play with enough time for students to write a reflection of what they’ve done in the game in their online journals. He finds the reflection helps solidify their learning and gives them practice with both oral and written communication skills. Because none of the pre-built lessons in MinecraftEDU are explicitly for language teachers, Irvin finds himself purusing what’s out there and generating lots of creative ways to work his curriculum into what he finds. For example, in an upper level Spanish course students take for college credit, Irvin assigned a survival world created by MinecraftEDU founder Joel Levin for the unit on environmental conservation. In Levin’s scenario, classmates are the last remaining people on earth and there is only one tree still alive. The rest of the human race is waiting for the world to be inhabitable in outer space. To win the challenge the team must repopulate the forest and make earth safe for life again. But the only way the class can alert survivors in space that earth is safe again is to send up a rocket, which they must make by smelting iron. That can only be done by burning trees to make a hot fire. The goals are at cross purposes and students have to decide the best course of action. “In my class they’re discussing all these scenarios and what to do or not do in Spanish, which is awesome because it’s super high level thinking,” Irvin said. “It’s way beyond anything I would have expected them to do.” And it was easy for Irvin to set up. He downloaded the pre-built world and then went in and changed all the signs from English to Spanish. It took him ten minutes and he got an engaging lesson that gave students a chance to use new vocabulary and language skills to argue their position. “A teacher who doesn’t really have experience playing a lot can still do awesome things because the kids are going to be so fired up,” Irvin said. Experienced players in his classes often offer to be teaching-aids, helping other students hone their basic Minecraft skills. Irvin often records what his students do in the game, both for assessment and to keep a record of the awesome things they’ve built. Irvin says it’s easy to keep students on task in the game because as a teacher-player in the game he has more powers than other players. He can instantly teleport to wherever a student is working and remind them to stay on task, or freeze a player who has wandered. He can also go into an invisible mode to see what students are doing when they don’t know he’s there. Irvin has three tips for teachers looking to get started. Use MinecraftEDU. It’s cheap, easy, and there are a lot of worlds to steal from or use, along with lesson tips. Get a more experienced player to walk you through the basics and mess around a little in the game to become familiar. Start with a single project that you’d like to improve, maybe a poster project. Tell the students they will be able to demonstrate their knowledge in three dimensions instead. Set parameters and guidelines for how students should interact within the game. Minecraft lends itself well to teaching math because everything is built out of blocks, making it easy to do geometry. Area and volume problems at the bare minimum. Math is also a subject many students find difficult and a different way of engaging them could help spark enthusiasm. Stephen Elford is a secondary math and science teacher at a rural public school in Victoria, Australia. He played Minecraft for fun at first, but then realized how much math was involved and began experimenting with using it as a classroom tool. Elford has found Minecraft’s “crafting mode” to be an effective way to teach basic algebra because Minecraft players have to craft all the tools they use to build out of raw materials harvested in the world. Different implements like an axe or a torch require different raw material recipes. Elford’s students wrote their own recipes (which look a lot like equations) using base materials. For example, one log = 4 planks. If you had 52 logs how many planks would you have and what formula would be used to represent the problem? Elford doesn’t ever force students to use Minecraft for projects, but he likes to offer it as an option because he’s noticed that some of his most disengaged learners excel when given an alternative to traditional pen and paper equations. “The four students who did that project got a very good understanding of how algebra can be used in virtual life situations and how to go about converting and simplifying units,” Elford said. In other lessons Elford has used a more straightforward method, asking students to solve problems to earn access to new parts of the world. Elford says one student in particular stands out because he had done almost no work in school for more than three years. But when Minecraft was involved he perked up. “He showed a depth of understanding that I just didn’t think was possible given his participation,” Elford said. “It blew my mind.” It was that “ah ha” moment many teachers live for, but that doesn’t always come easily or often. Elford has found Minecraft to be powerful in science as well, where he mostly uses the game to simulate scientific experiences that kids wouldn’t otherwise get in public school. For example, in his senior biology class, Elford uses Minecraft to give students a tour of an animal cell. Then, they get to watch as a single strand of DNA is transcribed into mRNA, which conveys the instructions to create complex proteins that do most of the work in the body. “When I’ve done this lesson in the past it’s been a lot more powerful and longer lasting for the students,” Elford said. He’s also uses Minecraft to start discussions. For example, his rural school doesn’t have the tools to measure Earth’s gravity, but his students can measure the gravity in Minecraft and then discuss what their findings mean for earth. Or, Elford might let students destroy the world with a plague in Minecraft as a way to discuss evolution. Elford, like Irvin and Miller, is clear that Minecraft is just one more tool he can use to effectively communicate his content and the skills that accompany it. However, he’s encouraged by the staying power of lessons he’s taught using Minecraft and by the excitement even poor students often show for projects within the game. Any new initiative feels daunting, but the only way to get started is to jump in. The educators profiled here saw Minecraft as a potentially powerful tool and started experimenting with how it could fit their pre-determined curriculum. They continue to seek help and ideas from peers and use the many free resources available to them. In addition to the positive changes they describe in their students, many teachers noted that Minecraft has helped reignite the creativity and passion that first brought them to teaching.